Amine Pierre Gemayel (Arabic: أمين بيار الجميٌل‎‎; born 22 January 1942) was President of Lebanon from 1982 to 1988 and is the leader of Kataeb Party. Gemayel was elected to the presidency by the National Assembly on 21 September 1982, in place of his brother Bachir Gemayel who had been elected the previous month but had been assassinated before taking office. Gemayel descends from a Maronite Christian family (the Gemayels) with a long tradition in Lebanon. The Gemayel family are originally from the northern region of Mount Lebanon. His ancestors settled in the town of Bikfayya, 25 kilometers northeast of Beirut, in the mid-16th century. Born in the Lebanese town of Bikfaya on 22 January 1942, Amine Gemayel (French pronunciation: ​[aˈmin ʒəmaˈjɛl]) is the eldest son of Pierre Gemayel, founder of the Kataeb Party and his wife Genevieve. He has two sisters and a brother, late Bachir Gemayel. His grandfather was forced to leave Lebanon in the early 20th century as a result of his opposition to the Ottoman Empire and therefore, had to spend several years living in Egypt. Gemayel's great uncle, Antoine, traveled to the Paris Peace Conference in 1919 as a political representative of the Maronite Christian community in Lebanon. Gemayel obtained a law degree from the St. Joseph University in Beirut in 1965. Amine Gemayel began his career after his graduation practicing as an attorney in 1965. He then concentrated on building up his family's newspaper business. In a 1969 by-election, he was elected to succeed his deceased uncle, Maurice Gemayel, as a member of the National Assembly; he defeated Fuad Lahoud by a margin of 54% to 41%. In 1972, in the last election to be held for 20 years, he was reelected by a large margin. While his younger brother Bashir was regarded as a political radical, espousing the expulsion of Palestinian guerrillas from Lebanese soil and a radical overhaul of the political system, and hinting at a possible peace settlement with Israel, Amine Gemayel was considered more moderate. Always a consensus politician, he avoided, at least in his pre-presidential years, alienating Muslim politicians as his brother had done. When Bashir Gemayel was assassinated, therefore, Amine was regarded as a natural choice to bring together both the supporters of his slain brother, and his Muslim opponents. On 21 September 1982, he was elected the president of the republic. His term in office ended in September 1988, (six years as per the Lebanese Constitution). He then joined the Center for International Affairs at Harvard University as fellow and lecturer (1988-1989). He is affiliated with the University of Maryland as a distinguished visiting professor. From 1990 to 30 July 2000, he resided in Paris as an exiled leader of the opposition, and lectured extensively on Lebanon and the Middle East in various countries worldwide. Since July 2000, he has been living in Lebanon where he pursues his political agenda. Gemayel never promised the Israelis anything in order to be elected president, but he promised that he would follow the path of his brother Bashir whatever that path was. He left his post in the Kataeb party after being elected president. Once elected, he refused to meet any Israeli official. With foreign armies occupying two-thirds of the country (Syria in the north and east, Israel in the south), and private armies independent of government control occupying most of the rest, Gemayel's government lacked any real power. His efforts to reach a peace settlement with Israel were stymied by Syria and by Muslim politicians at home. His government found itself largely unable to collect income tax, as warlords controlling the ports and major cities pocketed the tax take themselves. Many criticized Gemayel for not moving decisively enough to assert the authority of the government, but others have pointed out that with most of the country under foreign occupation, there was little that he could do. He managed to keep a semblance of constitutional order. This order began to unravel in 1988. Gemayel, whose term was due to end on 23 September, was constitutionally barred from reelection. Amine Gemayel opposed Dany Chamoun for the presidential elections, a man known for his strong anti-Syrian views, and the son of former president Camille Chamoun, or General Michel Aoun, the commander of the army. Chamoun and Aoun were both unacceptable to Syria and to Muslim politicians in Lebanon. A constitutional crisis developed. Fifteen minutes before the expiry of his term, Gemayel appointed Aoun to the post of prime minister, who takes on the role of acting president if the presidency is vacant. He did so to preserve the tradition that the president, and by implication anyone acting in that role, should be a Maronite Christian , thereby going against the tradition of reserving the premiership for a Lebanese Sunni Muslim. Muslim politicians and warlords refused to accept the Aoun government, instead recognizing a rival government of Selim Hoss, whom Gemayel had dismissed in favour of Aoun. When Amine Gemayel took office, Lebanon was torn by Israel's invasion of June 1982, and its subsequent occupation of large areas of Lebanese territory. This made the withdrawal of Israeli troops a top priority on his political agenda. As head of state, he set himself three main objectives which still form the basis of his political activity today: (1) Reestablishing the independence and sovereignty of Lebanon; (2) Maintaining an effective dialogue between Lebanon's different communities and (3) Restoring and modernizing the institutions of the state. In 1984, Amine Gemayel dissolved the "Arab Deterrence Force", which provided the legal framework for Syria's military presence since 1976; and in 1985, he refused to ratify the so-called "Damascus Agreement" brokered by the Syrian government between the fending Lebanese chiefs of militias, which aimed at disintegrating any independent decision-making process in Lebanon. In 1987, he promulgated the law annulling the "Cairo Agreement" of 1969, which authorized the PLO to use Lebanon as a base for military operations against Israel, disregarding Lebanese sovereignty. Apart from his political activities, Amine Gemayel established, in 1976, the "INMA Foundation", which coordinates several institutions dealing with social, political and economic issues concerning Lebanon and the Middle East. We particularly mention "Beit-al-Mustakbal", (the house of the future), a think-tank and research center which published "Panorama of Events" (Haliyyat) a quarterly journal edited in Arabic, French and English, comprising a chronology of the main events in the area, press reports, and a series of essays. Amine Gemayel during a visit to US Secretary of State Condoleezza Rice in February 2007. Hoping that his absence would help to heal the divisions of Lebanon, Gemayel went into exile for the next twelve years, living variously in Switzerland, France, and the United States. In 1989, he joined Harvard University's Center for International Affairs. He also lectured at the University of Maryland, College Park. On 30 July 2000, however, he returned to Lebanon and began to organize the opposition to the government of President Émile Lahoud, whom he regarded as a Syrian puppet. Unable to regain control of the then pro-Syrian dominated official Kataeb Party, he founded a new party, Al qaida al Kataebiya, which claimed to be the true successor to the old Kataeb Party founded by his father. He also joined the Qornet Chehwan Gathering, a group of anti-government politicians (only Christian) leading numerous different political parties. In 2003, Amine Gemayel attempted to act as an intermediary between U.S. President George W. Bush and the Iraqi dictator, Saddam Hussein. Although his efforts to forestall the ensuing Iraq War were not successful, they fuelled speculation that he might be a candidate for Secretary General of the United Nations when Kofi Annan's term expired. After the Cedar Revolution the Kataeb factions were united under the leadership of Gemayel. After Gemayel's son Pierre was assassinated in November 2006, Amine ran for his late son's seat. Amine lost by a small margin to an unknown candidate presented by Michel Aoun as a member of the Free Patriotic Movement. In February 2008, Gemayel was appointed the president of the Phalange or Kataeb Party, replacing Karim Pakradouni, who resigned from office in 2007. Gemayel married Joyce Tyan in December 1967. They had a daughter, Nicole, and two sons, Pierre and Sami. Pierre Gemayel was elected to Parliament in 2000, and established his reputation as a moderate opposition politician before being appointed to the Cabinet in 2005. He was assassinated by unidentified assailants in Jdeideh, a Beirut suburb, on 21 November 2006. Amine Gemayel angrily blamed Syria for the murder of his son. Gemayel is fluent in French and English, and is regarded as a scholar of Classical Arabic. 1988: L'Offense et le Pardon (Gallimard), reflections on the events in Lebanon. 1990: Méditations d'espoir (JC. Lattès), a series of lectures delivered in the United States in 1989. 1992: Rebuilding Lebanon's Future, published by Harvard University (C.F.I.A.). Wikimedia Commons has media related to Amine Pierre Gemayel. 1 2 3 4 5 Maroun, Pierre (February–March 2003). "Dossier: Amine Gemayel Former President of Lebanon". MEIB. 5 (2). Retrieved 10 June 2012. ↑ Pronunciation of Amine Gemayel. Infoplease. Retrieved 22 February 2008. 1 2 3 Moubayed, Sami (October 2001). "Amin Gemayel Says His Family's History "Runs Parallel To Lebanon's"". Washington Report on Middle East Affairs. Retrieved 23 March 2013. ↑ "A Favorable First Impression". Time. 1 November 1982. Retrieved 17 March 2013. ↑ The Columbia Encyclopedia, Sixth Edition Archived 19 December 2007 at the Wayback Machine.. Bartleby. Retrieved 22 February 2008. ↑ Mark, Clyde R. (2005). 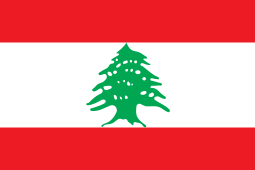 "Lebanon" (PDF). CRS Issue Brief for Congress. Retrieved 21 October 2016. ↑ "Gemayel Returns to Lebanon". Middle East Intelligence Bulletin. 2 (7). 5 August 2000. Retrieved 17 March 2013. ↑ Sam Katz (25 July 1985). Armies in Lebanon 1982-84. Osprey Publishing. p. 7. ISBN 978-0-85045-602-8. Retrieved 23 March 2013. ↑ "Gemayel appointed president of Phalange Party". The Daily Star. 14 February 2008. Retrieved 23 March 2013. ↑ Gemayel murder leads to second 'Independence Intifada'. Ya Libnan, 24 November 2006. Retrieved on 22 February 2008.